As many of you who read this column may or may not know, as a Libertarian, I have a philosophically deep opposition to the idea of government. Time and again, I have had to reiterate my belief that ordinary Nigerians will have to build bottom-up institutions that can act as an alternative to government if they will still have a country that will work for them. One of the most common questions my edgy philosophy raises is what a bottom up institution that can act as an alternative to the Government would look like. Unfortunately, many ordinary Nigerians don’t realize they are already living in a society where their own small landlords/residents association may appropriately rival or even supersede the impact of the government of the Federal Republic of Nigeria in all its bloated might and false glory. As such, I feel compelled to make a small monthly contribution to our collective enlightenment in this respect. Starting this month, we’ll be starting a new set of series within this column. Every last week of the month, I’ll tell you a relatable story of how ordinary people like you are taking back their countries by building viable alternatives to government’s inefficient institutions. My hope is that this series may inspire a person or two to think creatively about how they can build such viable institutions in their own communities instead of just loudly complain about a government that does not exist..
Our inaugural story in this series is on a small community called Abedares in Kenya. You see, the people of Abedares waited fourteen years for the Kenyan Power and Lighting Company (KPLC) to implement the government’s longstanding promise of rural electrification to no end (sound familiar?). Eventually, the people of Abedares got tired and took on the monster of darkness –not by a blaring competition of noise polluting generators –but together as one cham’a. One community. In 2005, one of the residents of Abedares, Mzee Ngai and other likeminded villages decided to form the Gatiki Electrical Company. The company will generate cheap electricity for the village using water from the Abedares range which is Kenya’s biggest water catchment area. Well, the company creatively sourced its initial capital by selling shares to interested villages at $130 each. Ngai, told African Business Magazine, “ [even though] people are poor, they were so enthusiastic about the project that even those who couldn’t afford the $130, paid what they could, so we have members who paid $25 and have been slowly raising their stakes in the company”. In the end they were able to gather 7,000 investors for the company. Since then, they have also been able to raise another $100,000 from JP Morgan. What is so impressive is that the Gatiki company’s rates are considerably lower than those at Kenya’s larger national power generating company, the KPLC. While Gatiki’s consumers pay a minimum of 65 cents and a maximum of $1.25, the KPLC charges almost ten to fifteen times as much. Now I am by no means suggesting that all we need to solve our endemic infrastructure problems are a few Gatiki’s. However, Gatiki is an example of the kind of community powered creative problem solving that builds alternative institutions which will give ineffectual governments a run for their electoral money. To conclude, allow me to commend the government on its moves to strike down laws that have given the federal government a historical monopoly over rail and power infrastructure this country. Hopefully, given the government’s dedication to opening up participation in these sectors to local communities and state governments, there will soon be less excuses for those wishing to contribute at the local level to the very important task of building a modern Nigeria. 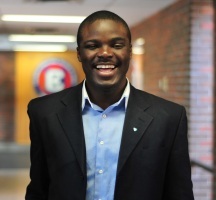 Aboyeji is CEO of Bookneto, a student focused education technology company based in Canada. In 2008, he worked as an intern at the Settlement and Integration Services Organization in Hamilton and then went on to work with the World Youth Alliance at the UN Headquarters in New York as an intern. Shortly before founding Bookneto, he served as the President of one of Canada’s largest student publishing companies, Imprint Publications. This is a great and inspirational story. You are right that in Nigeria, the government is almost non existent. Many people provide their own electricity and pump their own water among other things. The people are already semi-autonomous and need to realize this and take upon initiatives to better impact their communities. we should be the change we seek in our country. I will admit that it is easier to sit down and blame the government for everything wrong and fail to realize all of us twitter and internet activists are part of the problem. Lol, this is ridiculous. Pray, tell how challenging the government is wrong? Do you then imply the government is beyond reproach? I think the idea that the government is external to the people is what gives rise to the idea that the government needs to be fought/challenged. We need to see that the government is us. 15 years ago, GEJ was just another average Nigerian bitching about the inadequacy of the Nigerian system. 15 years from now some of those who went on the Occupy Nigeria protests will be senators, governors & federal officers. Will they reject thier entitlement of 4 official cars (re:Oteh)? Or exhorbitant senate allowances and salaries? I think rigth there is where it makes sense to say the enemy isn't the government. The enemy is within, we are our own enemies. Every 18 year to 40 year old with a Twitter & Facebook account is an activist and knows exactly what is wrong with Nigeria. Does that mean all Nigeria has to do is wait for this generation? your guess is as good as mine…..
Nice and inspiring. I must confess that this has me believing your argument that we the people can build alternatives to govt. Smart of you to have mentioned FG letting go of their monopoly in the power sector. Hopefully, we will start to see small power stations targeted at specific areas. That just might be the biggest change in the power sector since 1999. Practical example. On one hand we have to grab control of our collective destiny. On the other, we have to imbibe the culture of demanding for whatever we consider to be our rights from all tiers of government. Thankfully, both options aren't mutually exclusive. Good article.